New Delhi : No alcohol for one week. This is what the pilots of private carrier Jet Airways have decided as part of a novel way to observe a flight safety week at the airline from January 30 to February 5. The airline pilots, who have seldom found themselves at the receiving end for one reason or the other, have also decided to adhere to "all stabilised approach" in the operations and flight duty time limitation (FDTL) norms, airline sources said. A stabilised approach is a key feature to a safe approach and landing and a part of the DGCA formulated Standard Operating Procedure (SOP) for safe flight operations. Mumbai - Domestic air carrier Jet Airways has announced special five-day fares for all passengers traveling in its economy class on the domestic network, effective yesterday to September 10. One of the special all inclusive fares starting from Rs 1,999 is for travel period between October 7, 2014 to January 15, 2015, the airline said in a release. Another 5-day special fare starting Rs 600, excluding taxes, is for travel period between January 16, 2015 to July 31, 2015. New Delhi - The Supreme Court Tuesday sought Centre's response within four weeks on pleas by BJP leader Subramanian Swamy seeking Cabinet note concerning Jet-Etihad Airways deal and copy of the transcript of tapped telephonic conversation of former corporate lobbyist Niira Radia in which she had allegedly talked about civil aviation sector. A bench comprising justices H L Dattu and S A Bobde asked Additional Solicitor General L Nageshwar Rao who accepted the notice on behalf of the Centre to file response on Swamy's application. Mumbai : Jet Airways Wednesday sought a month's time to clear about Rs 100 crore worth of salary arrears of its pilots, who have been expressing their ire against the delay in making the payment, airline sources said. The management's plea came during an almost six-hour meeting with representatives of pilots at the airline's headquarters here this afternoon, the sources said. The meeting was attended by chief executive-designate Cramer Ball and other officials while the pilots' representatives came under the banner of National Aviators Guild (NAG) which acts as an interface between the pilots and the management. Mumbai: Around 300 air passengers, who were stranded for nearly 22 hours after a London-bound Jet Airways plane was grounded due to a technical glitch, finally left for for their destination this morning. "The stranded flight took off at around 11.45 AM today after a long delay of 22 hours. The airline today operated it as a special flight 9W 1118 with an Airbus 330," sources told PTI here. The London flight was grounded due to technical issue, Jet Airways spokesperson had said in a statement yesterday, adding that the airline will be operating a special flight on Saturday morning to London Heathrow. 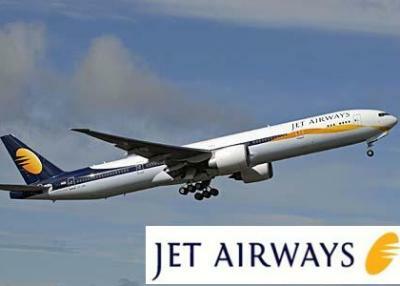 London : Jet Airways has cancelled its evening flight from London's Heathrow airport to Delhi for "operational reasons". No further information was available for the reason behind the cancellation. "The flight to Delhi has been cancelled for operational reasons and the one to Mumbai has been delayed until tomorrow. Accommodation is being provided to passengers at the airport," a Jet Airways guest services executive told. 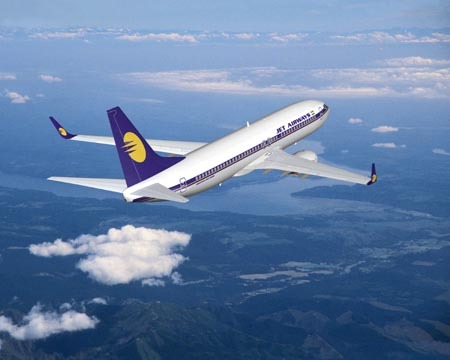 Mumbai - Jet Airways on Tuesday extended its special economy class fare offer by two more days. The city-headquartered airline had on July 31 launched a pan-India sales scheme, offering fares as low as Rs 1,499 on all its economy class domestic networks. Originally the offer was to end today. But 2-day special fare offer will now be available for sale from August 6 to August 7, with travel effective from September 1 onwards for flights within India, Jet Airways said in a release here. New Delhi: Jet Airways, which suffered a loss of Rs 4,130 crore in 2013-14, on Wednesday said it aims to turn profitable in the next three years and was planning a major overhaul of its fleet and products, months after Gulf carrier Etihad Airways picked up 24 per cent stake in it. "We plan to reduce losses in 2015, consolidate in 2016 and turn profitable in 2017.... We are already on track as our international business has turned profitable. We now have to take our business forward," Jet's CEO designate Cramer Ball told a press conference here. Ball is yet to get necessary clearances to formally take over his position. Mumbai, May 27 Jet Airways Tuesday reported a net loss of Rs. 2,153.57 crore for the quarter ended March 31, 2014, due to high fuel and interest costs. The company had reported a net loss of Rs. 495.53 crore for the corresponding period of last fiscal. For the year ended March 31, 2014, the airline posted a net loss of Rs. 3,667.85 crore from a loss of Rs. 485.50 crore in the like period of last fiscal. In terms of consolidated results for the year ended March 31, 2014, the group posted a net loss of Rs. 4,129.76 crore from a loss of Rs. 779.78 crore. Jet Airways said it was in the process of re-planning its strategy for the U. S. market in wake of the recent downgrade of India's aviation sector by the United States' Federal Aviation Administration (FAA). The U. S. FAA recently downgraded its safety rating for Indian aviation sector from Category 1 to Category 2. The move barred Indian carriers from making an increase in number of flights to the U. S. Jet Airways and state-run Air India are the only two Indian carriers that operate flights to the U. S.
The Jet-Etihad association will strengthen both carriers as well as the economies of India and the UAE, Etihad president James Hogan said. Naresh Goyal-led Airways on Wednesday confirmed that it had transferred equity shares worth Rs 2,060 crore or 24 per cent stake in the carrier to Etihad, adding that the strategic alliance had taken effect with immediate effect. In addition, the Indian carrier announced two board positions for nominees of Etihad. New Delhi, Nov 20 : Jet Airways Wednesday said it has completed 24 percent stake sale to Abu Dhabi-based carrier Etihad Airways for Rs. 2,069 crore. Jet Airways said in a statement that "both airlines closed the transaction for the subscription of a 24 percent equity stake by Etihad Airways in Jet Airways". "All requisite Indian regulatory approvals had been obtained by Nov 12, 2013. Jet Airways has, on Nov 20, 2013, issued and allotted 27,263,372 equity shares of a face value of Rs. 10 each at a price of Rs. 754.7361607 per equity share on a preferential basis to Etihad Airways," the statement said. Auditors of listed airlines Jet Airways, SpiceJet and Vijay Mallya's grounded carrier Kingfisher have raised red-flags on their 'going concern' status. The auditors said that the `going concern' status of a company depends on its ability to generate sufficient finance to meet short-term as well as long-term obligations and avoid any potential insolvency risks. Of the three listed airlines, Kingfisher received the most stringent set of adverse auditor comments. Jet Airways has been awarded with lion's share of the total allocation of seats from the increased bilateral seats entitlements signed between India and Abu Dhabi. Of the total increased seat allocations, Jet Airways has received 44.8 per cent; while rival carrier SpiceJet has received 28.2 per cent. Air India has received nearly 27 per cent of the total increased seats. Senior BJP leader Subramanian Swamy’s plea challenging the Jet-Etihad deal will be heard by the Supreme Court on October 8. A Supreme Court bench headed by Chief Justice P. Sathasivam fixed the date for the PIL hearing after Swamy stressed that the matter needed urgent hearing as the Government’s Cabinet Committee on Economic Affairs (CCEA) has already approved the deal. According to a new report, manufacturers in the UK are planning their fastest increase in capital investment during the year since the financial crisis began. The growth expectation indicates that the UK economy is headed for a strong recovery. Manufacturers' association EEF and accountants BDO said that the a total of 24 per cent of companies were planning to buy machinery and equipment compared to just 7 per cent recorded in a similar survey conducted during the month of May.